Sandwich ELISA analysis of Human CD40 binding using Mouse anti Human CD40 antibody, clone 3B2 (MCA2788GA) as a capture reagent and biotinylated Mouse anti Human CD40 antibody, clone LOB7/6 (MCA1590B) as a detection reagent with purified Human CD40 as antigen for the generation of the standard curve. Detection is by HRP conjugated streptavidin. Microtitre plate is read at O.D. 450 nm on the Bio-Rad iMark Microplate Absorbance Reader (Bio-Rad Catalog 168-1135). Undiluted serum and plasma samples are shown green and orange respectively. Phycoerythrin conjugated Mouse anti Human CD40 antibody, clone LOB7/6 (MCA1590PE) used to evaluate CD40 expression on PBMC by flow cytometry. 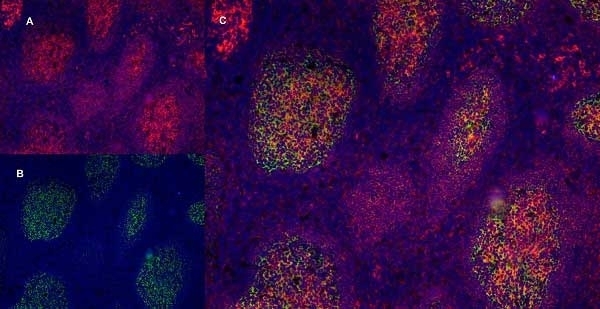 Accessory Cells Are Activated by iRBCs PBMCs from ten malaria-naïve donors were cultured with live iRBCs or E. coli LPS for 24 h or left unstimulated. Surface expression of HLA-DR, CD40, and CD80 on accessory cells was analysed by flow cytometry. Accessory cells were defined as HLA-DR+ CD11c+ cells (A, left), and CD14+ monocytes and CD14− mDCs were selected for further analysis (A, right). Representative examples of surface expression levels of CD40, HLA-DR, and CD80 on HLA-DR+ CD11c+ CD14+ monocytes (B) and HLA-DR+ CD11c+ CD14− mDCs (C) are shown. Data are based on the collection of 100,000 total events. Results for all ten donors are summarised in (D). *, p <0.05; **, p <0.01; ***, p <0.001; p-values are for paired t tests comparing stimulated and unstimulated cells from the same donor. From: Newman KC, Korbel DS, Hafalla JC, Riley EM. Cross-talk with myeloid accessory cells regulates human natural killer cell interferon-gamma responses to malaria. Mouse anti Human CD40 antibody, clone LOB7/6 (MCA1590) used to evaluate CD40 expression on dendritic cells by flow cytometry. Effect of rapamycin (Rapa) on the phenotype and function of H1-DC. DCs were either untreated, matured in response to the maturation cocktail or treated with Rapa for 3 days prior to maturation. 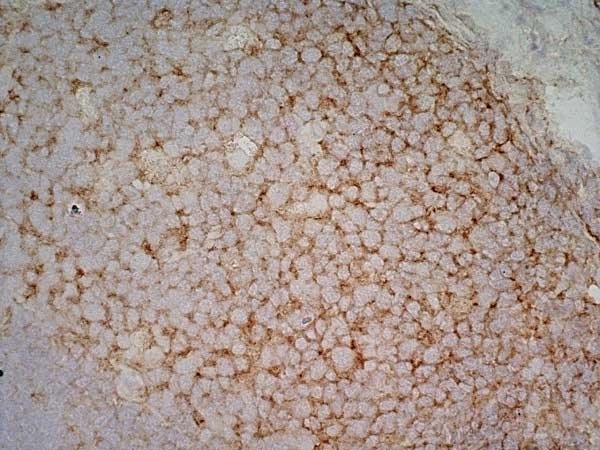 (a) H1-DC stained for the expression of the maturation marker CD83, the costimulatory molecules CD86 and CD40, as well as the inhibitory receptor PD-L1. Dead cells were excluded from analysis using 7-AAD. Open histograms represent the level of background staining using appropriate isotype-matched controls. Data from one of 3 independent experiments are shown. (b) Phenotypic analysis of control populations of moDC treated and stained in parallel with rapamycin. (c) Effect of rapamycin on the allostimulatory capacity of DC in the allogeneic MLR. DCs were mitotically-inactivated using mitomycin C and plated in triplicate at a top dose of 104 cells per well of a 96-well round-bottomed plate; naïve CD4+ T cells were plated at 5 × 104 cells/well. Cells were incubated for 5 days before pulsing with 3H-thymidine overnight. Graphs show the mean of triplicate cultures ± S.D. Data are shown from one experiment, representative of 3 independent experiments. From: Silk KM, Leishman AJ, Nishimoto KP, Reddy A, Fairchild PJ. Rapamycin conditioning of dendritic cells differentiated from human ES cells promotes a tolerogenic phenotype. J Biomed Biotechnol. 2012;2012:172420. FITC conjugated Mouse anti Human CD40 antibody, clone LOB7/6 (MCA1590F) used to evaluate CD40 expression on dendritic cells by flow cytometry. LEF-M interferes with DC differentiation. 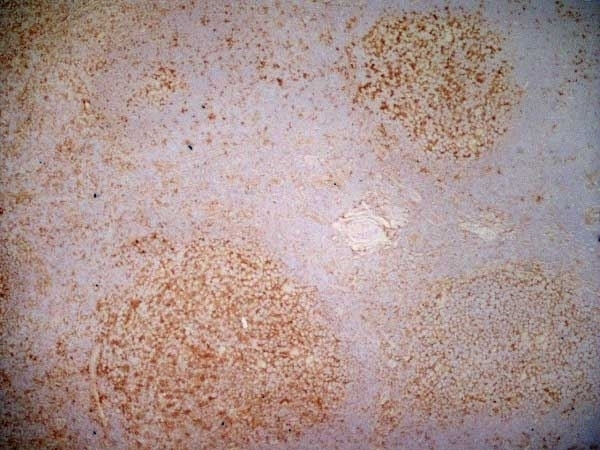 (a) Monocytes were cultured for 5 days with granulocyte–macrophage colony-stimulating factor (GM-CSF; 50 ng/ml) plus IL-4 (10 ng/ml) in the absence or presence of 150 μmol/l of the active metabolite of leflunomide (LEF-M). Subsequently, surface marker expression was determined using fluorescence-activated cell sorting (FACS) analysis. Open profiles with dotted line represent staining pattern with an isotype control antibody, open profiles with fine line indicate the staining pattern of differentiated control dendritic cells (DCs) stained with the indicated mAbs, whereas solid grey profiles show staining of DCs differentiated in the presence of LEF-M. (b) Myeloid precursor cells differentiated in the presence of LEF-M are resistant to maturation. Cells were treated as described above and then stimulated with lipopolysaccharide (LPS; 100 ng/ml) for 48 hours. Open profiles with dotted line represent staining pattern with an isotype control antibody, open profiles with fine line indicate staining of activated control DCs, and solid grey profiles show staining of DCs differentiated in the presence of LEF-M and subsequently exposed to LPS. Data are representative of at least four independent experiments. (c,d) The effects of LEF-M on DC differentiation are independent of pyrimidine depletion. The respective change in mean flourescence intensity (MFI) are shown (c) after the differentiation phase for CD40 and CD1a and (d) after subsequent maturation with 100 ng/ml LPS for CD40 and CD83 with and without 50 μmol/l uridine. 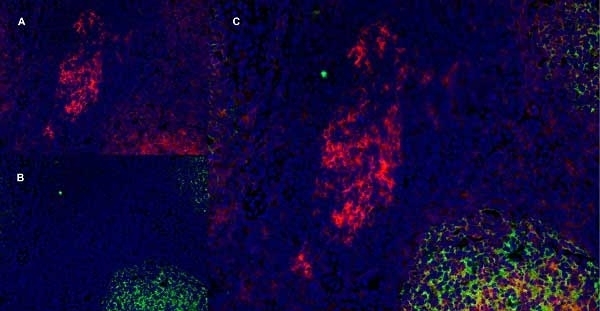 White bars represent control DCs, and black bars indicate LEF-M-treated cells. Shown are mean percentage control responses ± standard error of the mean, calculated from five to eight independent experiments. Student's t-tests were calculated for control versus LEF-M-treated DCs and for LEF-M-treated DCs versus without uridine addition, as indicated. *P <0.05, **P <0.01. From: Kirsch BM, Zeyda M, Stuhlmeier K, Grisar J, Smolen JS, Watschinger B, Stulnig TM, Hörl WH, Zlabinger GJ, Säemann MD. The active metabolite of leflunomide, A77 1726, interferes with dendritic cell function. Treatment with LEF-M during maturation of immature DCs leads to a differentially affected phenotype. Monocytes were cultured for 5 days with granulocyte–macrophage colony-stimulating factor (GM-CSF; 50 ng/ml) plus IL-4 (10 ng/ml). (a) On day 5 these immature dendritic cells (DCs; 5 × 105/ml) were activated with lipopolysaccharide (LPS; 100 ng/ml) in the absence or presence of 150 μmol/l of the active metabolite of leflunomide (LEF-M) for 48 hours. Surface marker expression was determined by fluorescence-activated cell sorting analysis. Open profiles with dotted line represent the staining pattern with an isotype control, open profiles with fine line indicate the staining pattern of DC exposed to LPS with the indicated monoclonal antibodies, and solid grey profiles show staining of DCs matured in the presence of LEF-M. The results shown are representative of five independent experiments. 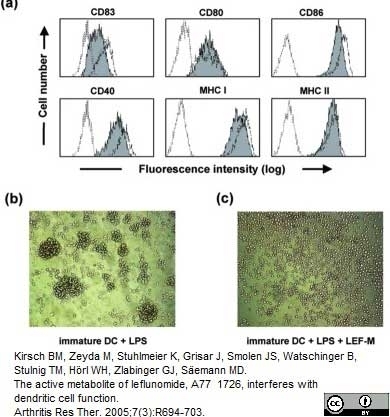 (b,c) Effect of LEF-M on maturation-associated clustering of DCs; immature DCs were stimulated with LPS in the (panel b) absence or (panel c) presence of 150 μmol/l LEF-M. After 8 hours of cultivation, cells were analyzed by inspecting photomicrographs obtained by light microscopy. Similar results were obtained in four additional experiments. MHC, major histocompatibility complex. Figure A. FITC conjugated mouse anti human CD19 (MCA1940F) and RPE conjugated Mouse IgG2a isotype control (MCA929PE). Figure B. FITC conjugated mouse anti human CD19 (MCA1940F) and RPE conjugated mouse anti human CD40 (MCA1590PE). All experiments performed on red cell lysed Human peripheral blood gated on lymphocytes in the presence of Human SeroBlock (BUF070A). Mouse anti Human CD40 antibody, clone LOB7/6 recognizes the human CD40 cell surface antigen, a 48kDa glycoprotein expressed by B lymphocytes and weakly by some monocytes. CD40 is involved in the process of B cell selection in germinal centres and is vital in T cell-B cell interactions. CD40 Ig(Fc) fusion protein containing the EC region of human CD40 and Fc region of human IgG. Quadbeck, B. et al. (2002) Maturation of thyroidal dendritic cells in Graves' disease. Scand J Immunol. 55 (6): 612-20. Kirsch, B. M. et al . 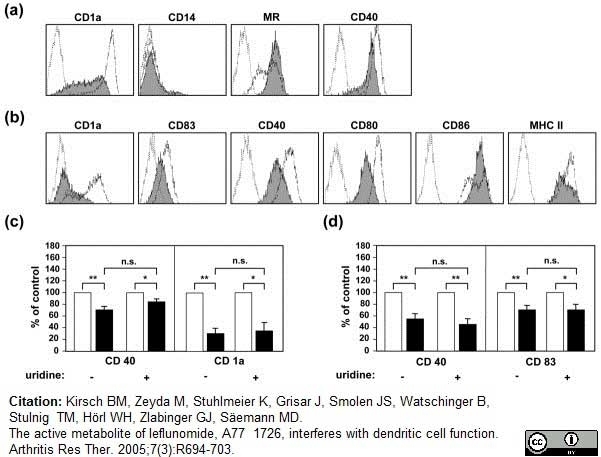 (2005) The active metabolite of leflunomide, A77 1726, interferes with dendritic cell function. Arthritis Res. Ther. 7: R694-R703. Cheadle, E. et al. (2003) Mycobacterium bovis bacillus Calmette-Guerin-infected dendritic cells potently activate autologous T cells via a B7 and interleukin-12-dependent mechanism. Carpenter, E.L. et al. (2009) Activation of human B cells by the agonist CD40 antibody CP-870,893 and augmentation with simultaneous toll-like receptor 9 stimulation. J Transl Med. 7: 93. Garcia-Nieto, S. et al. 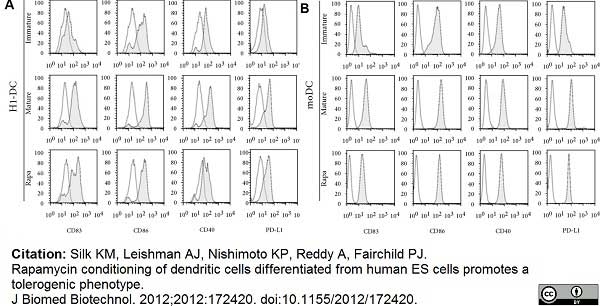 (2010) Laminin and Fibronectin Treatment Leads to Generation of Dendritic Cells with Superior Endocytic Capacity. Wang, Y.S. et al. 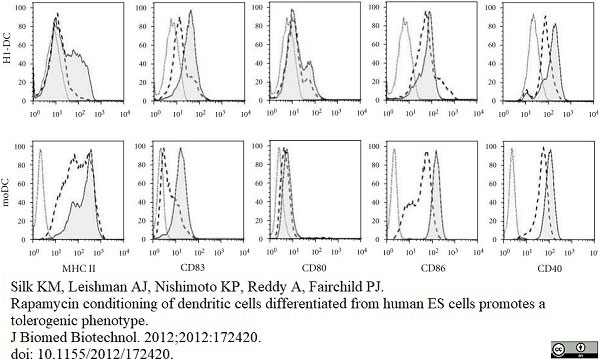 (2007) Characterization of canine monocyte-derived dendritic cells with phenotypic and functional differentiation. Can J Vet Res. 71: 165-74. Vlachoyiannopoulos, P.G. et al. (2004) Anti-CD40 antibodies in antiphospholipid syndrome and systemic lupus erythematosus. Clin Vaccine Immunol. 13: 678-83. Newman, K.C. et al. 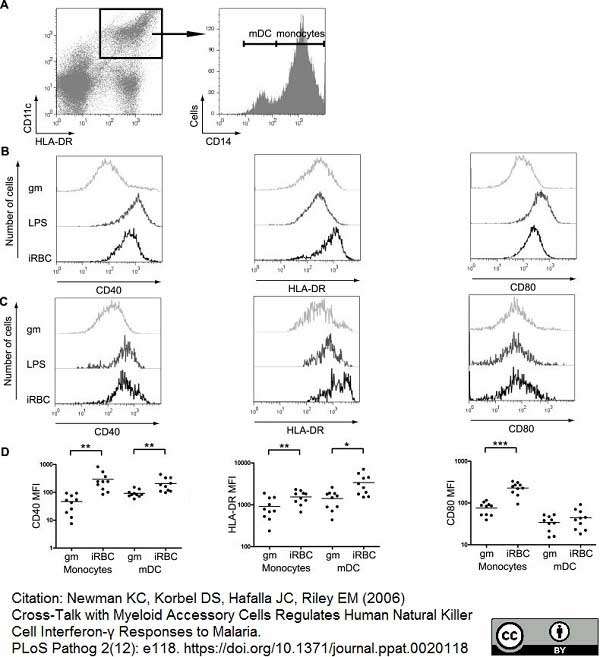 (2006) Cross-talk with myeloid accessory cells regulates human natural killer cell interferon-gamma responses to malaria. Kuijf, M.L. et al. (2010) TLR4-mediated sensing of Campylobacter jejuni by dendritic cells is determined by sialylation. Huizinga R et al. (2015) Innate Immunity to Campylobacter jejuni in Guillain-Barré Syndrome. Ann Neurol. 78 (3): 343-54. Yıldırım C et al. (2015) Galectin-2 induces a proinflammatory, anti-arteriogenic phenotype in monocytes and macrophages. PLoS One. 10 (4): e0124347. Brencicova, E. et al. (2017) Interleukin-10 and prostaglandin E2 have complementary but distinct suppressive effects on Toll-like receptor-mediated dendritic cell activation in ovarian carcinoma. PLoS One. 12 (4): e0175712.